Christopher shared his insights on the current cultural foodscape and gave us a taste of what’s cooking at Christopher Kimball’s Milk Street. His more than three decades of making culinary prowess accessible to everyone are channeled through this new, Boston-based venture that includes Christopher Kimball’s Milk Street Magazine and Christopher Kimball’s Milk Street Radio (find a station near you). 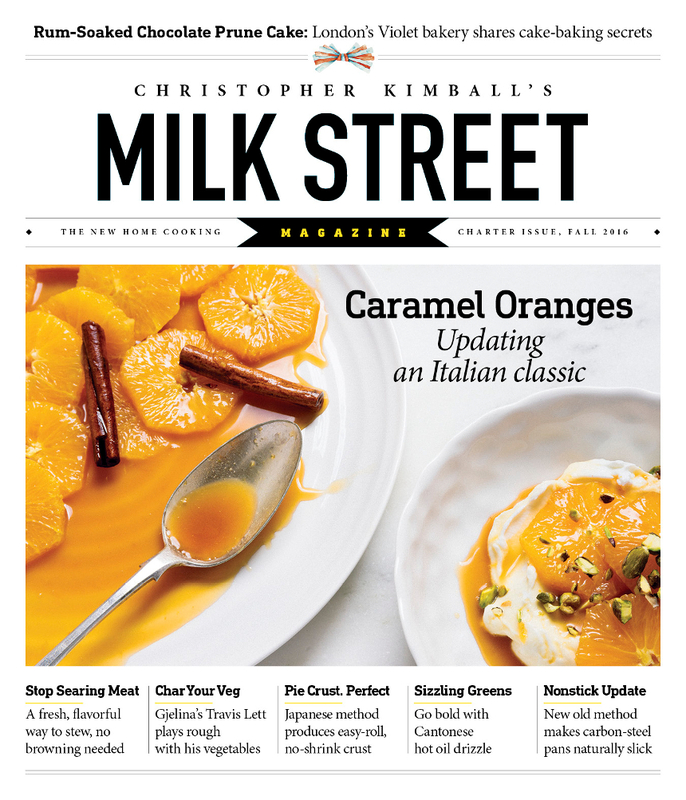 Wouldn’t you love to get your hands on the charter issue of Christopher Kimball’s Milk Street Magazine? Wouldn’t it be great if it were free? You’re in luck! For a limited time, a copy of Issue #1 is yours for the asking. Don’t we always turn you on to the best stuff? For those looking for in-person instruction, his Milk Street cooking school is already open for enrollment with small class sizes in a predictably dreamy kitchen. Can’t make it to Boston? Not to worry, Christopher Kimball’s Milk Street Television is already in production. The sad news? We’ll have to wait until Fall of 2017 for the launch. Christopher Kimball’s Milk Street Magazine proves to offer a distinctive mood and reader experience, but with the thoughtfulness and expertise both home and professional cooks have come to expect. Christopher’s new entity, CPK Media LLC, is a multi-media company focusing on a fresh, healthier approach to home cooking. Christopher Kimball, founder of Cook’s Illustrated and America’s Test Kitchen, says that he started Milk Street to transform the American kitchen. “Our goal is to change how we cook,” says Kimball. “We’re going to open the door to a world of new ideas, new techniques, and new flavor combinations. There is no ethnic cooking. There are no foreign cuisines. It’s all just cooking,” he says. Over the next year, Milk Street Kitchen will roll out a public television cooking show, a retail cooking school at 177 Milk St., Boston, magazines, cookbooks, and a new digital platform. Kimball will continue to host his weekly public radio show. Just in Time for Pie! Christopher Kimball offers up a precious treasure as we glide into the holidays—the secret to a perfect pie crust. You can read the step-by-step instructions at Milk Street’s site, but if a visual demonstration of some of his techniques would help you muster up the confidence (I’m a little afraid of pie crusts, I’ll admit), take a gander at his demo via Williams-Sonoma’s YouTube channel. Home cooks can join Milk Street Kitchen for free recipes, cooking tips, Kimball’s notes from Vermont and for news updates (MSK website link). Milk Street Kitchen will also offer free classes to kids and parents. Partnerships with local and national nonprofit organizations will be announced later in the year. Christopher Kimball founded Cook’s Magazine in 1980 and served as publisher and editorial director through 1989. In 1993, Mr. Kimball re-launched Cook’s Magazine as Cook’s Illustrated and went on to found Cook’s Country magazine in 2004. Mr. Kimball is the host and executive producer of the two highest rated cooking shows on public (and cable) television: America’s Test Kitchen, currently in its 16th season, and Cook’s Country which begins its 9th season this September. He remains as host of both shows through 2016. Mr. Kimball is also the host of America’s Test Kitchen Radio, a weekly public food radio show (and podcast) broadcast on over 300 stations nationwide. Mr. Kimball is the author of several books including, most recently, Fannie’s Last Supper. In 2015, Mr. Kimball left America’s Test Kitchen to found a new company, Milk Street Kitchen, devoted to teaching home cooks fresher, better ways to prepare foods at home. Christopher Kimball’s Milk Street in downtown Boston — at 177 Milk Street — is home to the editorial offices and cooking school. It also includes the studio where Christopher Kimball’s Milk Street television and radio shows are recorded. Milk Street seeks to change how we cook by searching the world for bold, simple recipes and techniques. Adapted and tested for home cooks everywhere, the Milk Street team believes these lessons are the backbone of the new home cooking. For more information, go to 177milkstreet.com. The show forages the world to bring culinary insights and recipes to listeners, while telling interesting stories about the food we eat. It also shares simpler, more streamlined techniques for home-prepared meals. Kimball, the popular founder of Cook’s Illustrated will co-host the show with Sara Moulton, host of public television’s Sara’s Weeknight Meals. Other regular guests include The Sporkful host Dan Pashman, New Yorker writer Adam Gopnik, Upshot writer Aaron Caroll, and Stephen Muse, an expert on the history of food and wine. In addition to listening on the radio, you can also can experience the new Milk Street via podcast and their magazine. To get a taste of what’s coming, check out the show on Facebook, Instagram, and Twitter. In 2014, PRX launched Radiotopia, a podcast collective of 13 diverse, independent, story-driven shows, anchored by 99% Invisible from Roman Mars. The network has quickly grown to over 10 million downloads per month.